This morning José Panzarini, the gentleman responsible for player’s shirts, shoes and additional equipment in Palmeiras since 1981, passed away. 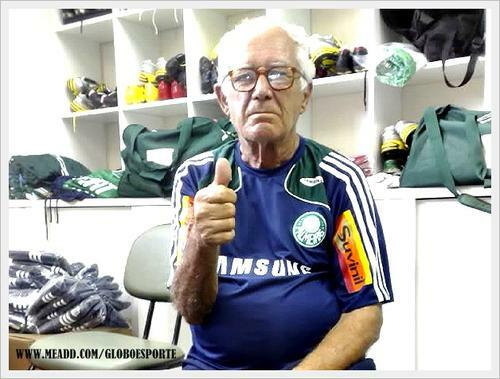 “Seu Panza”, as he was affectionately called, will be missed by all those who work at Sociedade Esportiva Palmeiras or has passed through the football department. Palmeiras took on leader Fluminense at the Maracana stadium on Wednesday. Fluminense scored after 15 minutes and then fell back, looking for opportunities to counterattack and kill the game. Palmeiras had the upper hand for most of the game and created several chances – including a goal by Kleber incorrectly flagged for offside (the final pass was made by a Fluminense defender) – but at times suffered with the occasional Fluminense charge. In the very end, a fierce Palmeiras’ blitz paid off beautifully: with three minutes of stoppage time, Tinga drew the ball far, finding Edinho free to head the ball to Ewerthon, who had all the time in the world to dominate and execute the shot. 1-1 was the end result; a draw with the sweet taste of victory. Watch the highlights here. In a meeting with members of the “Club of 13” – composed of the major football teams in Brazil – Palmeiras’ president Belluzzo aired his frustration in regard to the most recent chapters in the never ending drama of constructing a new stadium for Palmeiras. “There’s a manifestation of bureaucratic stupidity” he complained in reference to excessive demands for additional studies on anything from stadium noise to truck movements to/from the construction site. Despite all obstacles, construction is expected to start as of mid September. Lincoln is not too happy about Palmeiras owing him money, driving him to write a letter to the Club, requesting that the payment be made. Palmeiras director Savério Orlandi confirms that Palmeiras is in debt with Lincoln, but assures that everything will be solved within 15 days. Perhaps Lincoln’s attitude was not the smartest. Of course, he has the right to his money. But he’s been injured for some time, letting both supporters and coach Scolari rather frustrated. On top of that, rumour has it that he’s not satisfied with being less in the lime light than the likes of Valdivia and Kleber. Scolari is known for his short tolerance; unless Lincoln get his priorities right he might be out the door sooner than he imagines. CBF – The Brazilian Football Federation – has released the competitions schedule for 2011. It resembles this year’s, except for the Brazilian Cup, which finishes already in July (this year it ended in August). One important detail is that there will be no break during the America Cup (taking place in Argentina 3-24 July) meaning that those teams giving up players for the National Squad will be “punished”, at least in this respect. Tournament dates are: Brazilian Cup (16 February-8 June), Brazilian Championship A (22 May-4 December) and Brazilian Championship B (22 May-27 November), in addition to various State Championships (16 January-15 May). There are also a total of 12 “FIFA dates” reserved for games with the National Squad.